I HAVE NEVER BEEN INTO SPENDING A LOT OF MONEY ON FURNITURE, ESPECIALLY WHEN THE ONLY KIND OF FURNITURE THAT I LIKE IS DESIGNED BY ARCHITECTS AND IS MANUFACTURED TO SELL TO HIGH SOCIETY. MY NEW HOUSE IN 2000 NEEDED A SOFA IN FRONT OF THE FIREPLACE. 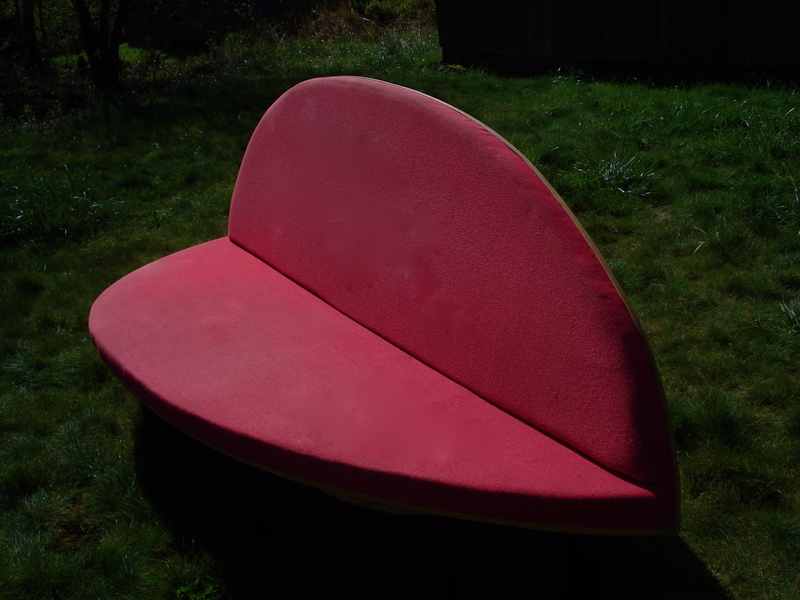 I DESIGNED SOME WAVY THING THAT WAS A CHALLENGE TO BUILD, SO I DISCARDED THAT DESIGN, AND GOT DOWN TO BASICS OF A SIMPLE SOFA FORM TO BUILD. MY TOOLS: A SKILL SAW , SABER SAW, SMALL TABLE SAW, AND A DRILL WITH PHILLIPS HEAD SCREW ADAPTOR. MY CARPENTER SKILLS ARE MINIMUM FOR FINISH WORK. I NEVER HAD THE POLISH WOOD TEMPERAMENT NOR INTEREST. I BUILT A 1/2″ SMALL MODEL AND DREW TO SCALE THE SCHEME. THE DESIGN WAS THE RESULT OF WHAT I PERSONALLY CAN BUILD MYSELF WITH PORTABLE TOOLS. I HAVE YET TO LEARN TO WELD, WHICH WILL BRING ANOTHER DIMENTION TO EXPLORE. THE LEGS MATCHED MY DINING ROOM TABLE. 4 INCH BLACK PLASTIC SEWER PIPE. THE DETAIL BEING A 2″ X PLUGS I CUT ROUND WITH THE SABER SAW AND SCREWED ON TO A 3/4 INCH FLANGE BOARD THAT I SCREWED ONTO THE BOTTOM 3/4 INCH PLY WOOD OF THE SOFA. I THEN SCREWED THE DRAIN PIPE TO THE PLUG. I DID ANOTHER PLUG FOR THE CLEAT AT THE FLOOR. EXPOSING THE WOOD PLUG 1/2 INCH. THE PLUG NOT ALL THAT STURDY IN FIR, BUT A COUPLE LAYERS OF THE 3/4 INCH LAYERED PLY HIGH QUALITY MAKES A BETTER PLUG. I HAD TO LEARN THAT THE HARD WAY WITH THE LEGS GIVING OUT IN THE FIR WHEN PUSHED LATERALLY. I HAVE A PHOTO OF A CREW OF MY SON AND LAWYER FRIEND HERMAN PETTEGROVE FLIPPING THE SOFA FOR A FAST REPAIR JUST BEFORE MY WEDDING. ANOTHER FEATURE BEING THE FAST REMOVAL OF THE LEGS FOR MOVING. THE PLYWOOD BEING A COUPLE OF 4′ X 8′ SHEETS OF BIRCH HIGH QUALITY PLYWOOD THAT CAN BE HAD FOR $35 A SHEET. I LIKE THE EXPOSED LAYERS OF THE PLYWOOD, THAT DRIVES PEOPLE CRAZY. BUT THAT IS THE NICE PART OF BUILDING IT YOURSELF, YOU JUST DO IT. SCREW THE CRITICS. THE CONNECTION BETWEEN THE BACK OF THE SOFA AND THE CONTINUOUS SOFA BASE , BEING A RIBBED SHELF SYSTEM, THAT ACTS AS A BEAM TO HOLD EVERYTHING TOGETHER. I GOT TWO 4 INCH FIRM FOAM CAMPING PADS 30″‘ X 6’ FROM FRED MEYER FOR $ 7 EACH . I SPLICED THE FOAM FOR THE EXTENDED LENGTH AND WIDTH WITH A BIT OF CONTACT CEMENT. THE FABRIC WAS PURCHASED FROM A DISCOUNT FABIC SHOP. A TOUGH TWO WAY STRECH MATERIAL. PROBABLY COST ABOUT TWENTY DOLLARS. I WAS AMAZED AT HOW I COULD STRETCH THE FABIC WITHOUT IT NEEDING ANY CUTTING OR SEWING TO FIT THE FOAM PADS. I TACKED THE FABRIC TO THE PLYWOOD EDGE. I CUT A FINISH 3/ 16 ” TRIM STRIP ,TO WRAP AROUND THE EDGES, WITH MY TABLE SAW FROM A GOOD QUALITY FIR TRIM BOARD. USING STAINLESS STEEL FINISH NAILS TO APPLY WHEN THE WOOD TRIM WAS WET AND BENT EASILY. I PAINTED A CLEAR COAT OF SPAR VARNISH WATER SOLUBLE TO FINISH OFF THE WOOD. SO FOR THE COST OF $ 130 IN MATERIALS AND A WEEKS WORTH OF MY TIME THE SOFA WAS BORN. THE SHAPE WAS A TURN ON. ALL SORTS OF CONNOTATIONS. I NEVER WENT THERE. I BEING TALL AND NEVER HAVING A PROPER FIT FOR MY BODY COULD BE SUPPORTED IN THE MIDDLE OF THE SOFA. WHERE AS OTHER PEOPLE OF SMALLER FRAME FOUND THE PROPER SIZE FOR THEM IN THE VARIED CROSS SECTIONS. I LIKED THE HIGH BACK THAT GAVE PRIVACY. SINCE THE BACK FACED THE STREET AND PEOPLE COULD LOOK INTO THE HOUSE. THE RIBBED BACK SHELF WAS USED FOR RECORDS, BOOKS AND SCULPTURE AT VARIOUS TIMES. THE ABILTY TO SUPPORT CONSIDERABLE AMOUNT OF WEIGHT WAS AN ASSET. I DESIGNED TWO BUILT IN ROTATING ROUND TABLES THAT CAME OUT FROM UNDER THE SOFA TO HOLD DRINKS OR SMALL PLATES. USEFUL AND AND FUN. A SINGLE BOLT BEING THE SUPPORT AND PIVOT POINT. I LIKED SLEEPING ON THE SOFA, THE LENGTH WAS PERFECT FOR MY LONG FRAME. I AND FRIENDS HAD MANY A LONG EVENING ON THE SOFA IN FRONT OF THE FIREPLACE WITH THE CRACKLING WOOD , FLAMES, SPARKS, AND LISTENING TO MY EXTENSIVE RECORD COLLECTION. IT WAS ALL SO WONDERFUL. THERE WAS A TEAR DROP THROW RUG ,THAT I MADE FOR MY FEET, ADDING TO THE DRAMA. WHEN WE HAD AN ESTATE SALE, NOBODY PURCHASED THE SOFA. I THINK I WAS ASKING $100 BUCKS. IT IS NOW BEING STORED IN A GARAGE WHERE IT IS A SHELF FOR TOOLS ETC. THE FABRIC STAINED, SO FORLORN AND IN NEED OF A GOOD HOME. WHO KNOWS HOW LONG, BEFORE IT IS TOSSED OUT.. SO IS THE LIFE OF GLEN HOWARD SMALL. I ALWAYS THOUGHT IT WAS A FANTASTIC DESIGN. Hi Glen.. Like many of your deisgn works this does double work. Which is what I like about it. Shelfing and sofa. Also the application of ‘natural’ stucture: the ribbing one finds in larger leaves. BTW I wrote a longer response but like many of my comments they dont post. bad computer maybe. thanks for the comment. you have a large range of interests. bigger than mine, which is refreshing. yes, the dual function plus the retractable tables. since i have spent a lot of time living in other peoples designs, my house in oregon the exception for ten years, the only thing i can add is the furniture. i must say it gives me a visual kick to look and interact with the items i build and use. architects and designers are so frightened of being scolded by their peers for questionable finishes and details, they just buy the furniture that have the stamps of approval from the profession, rather than building stuff. maybe i am wrong, they might not even have the limited craft skills i have to build anything. my father put a hammer and saw in my hands at four years of age. which helped create the adventuresome spirt to do it myself. Architects taste, that is the taste of so-called creative individuals is compromised by thier position of class and client. Architects in the position of begging clients tend to mirror the develper sub-class and reflect the tastes of money. Gone are the days of the artist the an enlighted clinet seeks out. Your art puts you at risk or ayt minimum sets you outside the cash cirlcle. I see so many students giving up on design because it makes them unemployable. It is so sad to see so many copycats who mirror men with money. I feel there is a confusion between who they are and who they work for. For a man to have integrity all one has to do really nis stand up striaght – and not bend over so much. YOU ARE TOO WISE, THAT BEING YOUR SALVATION TO SURVIVE. STANDING UP STRAIGHT IS SO DIFFICULT FOR THOSE THAT WANT TO BE LOVED AND FIT IN. MYBE WITH THE TUX , THAT THEY ARE ASSURED WILL NOT OFFEND ANYONE ETC. ONCE WEARING A SERGEANT PEPPER OUT FIT TO AN ARTIST GLEN VILPPU’S WEDDING THE DOCTOR FATHER OF THE BRIDE QUESTIONING MY INTENSIONS. REFLECTING ON THAT, I MEANT TO ASSERT MY INDIVIDUALITY AND BRING SOMETHING DIFFERENT TO THE SCENE, AND OF COURSE GET SOME ATTENTION. THE OUTFIT LOOKED ELEGANT AND FORMAL. BUT BUILDING INDIVIDUAL DESIGN FURNITURE IS A MINOR STATEMENT, YET SO RADICAL . WE ARE A SOCIETY OF CREAM PUFFS LACKING DESIGN BACKBONES. I KEEP PITCHING FOR DESIGN EXPRESSION. 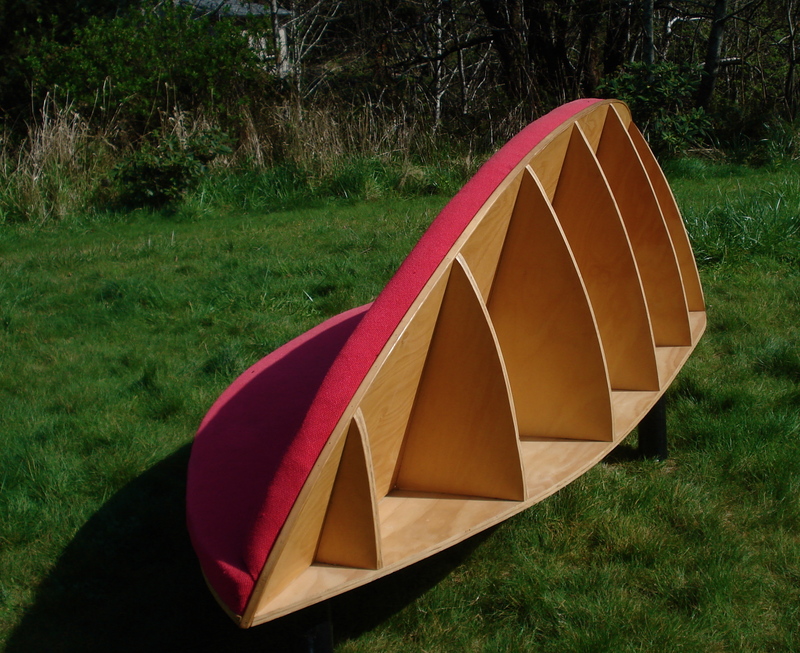 I KNOW IT IS ALL THERE, BECAUSE IF I GAVE A PROBLEM TO STUDENTS TO DESIGN A SIMPLE FURNITURE PIECE USING SOME PRINCIPLE , LIKE RIB CONSTRUCTION THEY WOULD COME UP WITH ALL SORTS OF GREAT STUFF. GETTING THEM TO CONTINUE ON THEIR OWN TO DO THAT IS THE PROBLEM. NOT CONFIDENT TO STRIKE OUT ON THEIR OWN FOR FEAR OF NEGATIVE JUDGEMENT. Glen, This is sort of out there, even for you so here goes. You menmtioned in your post that “THE SHAPE WAS A TURN ON. ALL SORTS OF CONNOTATIONS. I NEVER WENT THERE” this book PSCHOANALYTIC CRITICISM, all about , well, psychological interpretations of artworks. WHAT DO THEY SAY, IT IS IN THE EYE OF THE BEHOLDER. ZAHA RECENTLY GETTING A LOT OF FLACK ABOUT HER STADIUM SEEN AS A VIGINA. WHAT A BUNCH OF CRAP. YOU WOULD HAVE TO BE A BIRD TO SEE THAT IMAGE, AND BE TOATLLY OUT OF SCALE TO GET OFF ON. GULLIVER COULD NOT EVEN MAKE THE ASSOCIATION. 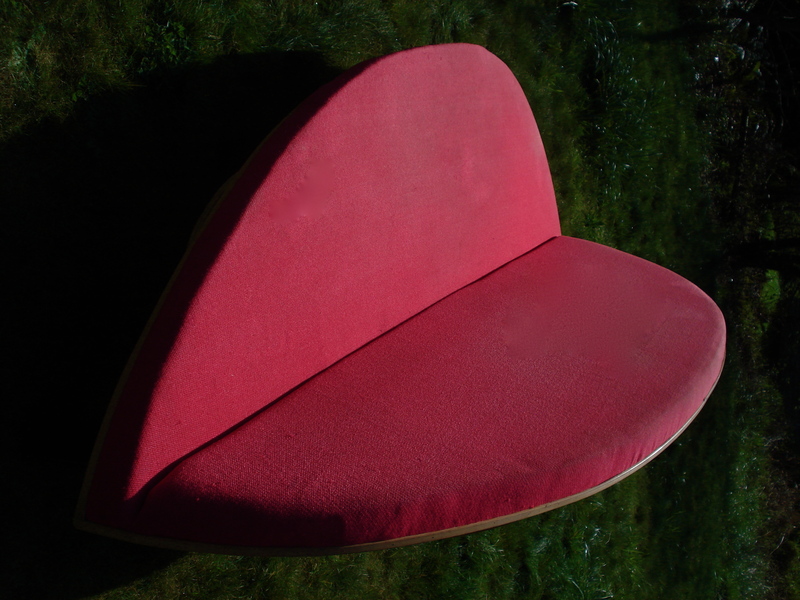 I SENT THE SOFA IMAGE OUT AS A VALENTINE’S GREETING. IT LOOKS LIKE A RED HEART. OTHERS SEE DIFFERENT THINGS. MY MOTHER COULD NEVER RELATE TO ANY OF MY DESIGNS UNTIL SHE PLACED AN IMAGE OF REALISM ATTACTED TO THEM. I LIKING THE SHAPE , THE VARIATION OF SEATING, AND SHELVES ON THE SOFA. ALL SO DIRECT AND OBVIOUS. BUT AS YOU HAVE MENTIONED BEFORE SO RADICAL TO THE NORMAL PERSON. IT DOES NOT LOOK LIKE THE SOFA THEY WERE RAISED WITH AND SEE IN MAGAZINES. THAT TO ME IS THE BIG BATTLE OF AESTHICS. WHEREAS A FLOWER, WHICH IS MUCH MORE RIGORUS IN ITS PATTERNS OF CURVES ETC. IS ACCEPTED. Glen, I was reading a book on theory, actually a theory book on theories, mostly mathematical theory. Logicans argue that the assumtions made in developing a therory usually end up proving itself. valid. A circle of proof in a sense. Mostly the arguments I read were about the use of math to solve engineering theories, hence the emphasis on math to prove science. The same with architectural theories from the Renaissance which prove that the orders and proportions found in antiquity are better, more beautiful than all others. Same with modernist abstraction or functional theories that justify thier notion of beuaty based on gestural dynamics or as with cost/function ratios. The means prove the ends in the case of theory. I bring this up beause I see in much of your works a different reference and a different theory. Yours based on orders found in nature, structural and formal. So what gives your works aesthetic value is different. Not the same as others. Different theories different outcomes. To judge aesthetics or design based on some other theory would be to miss the point.